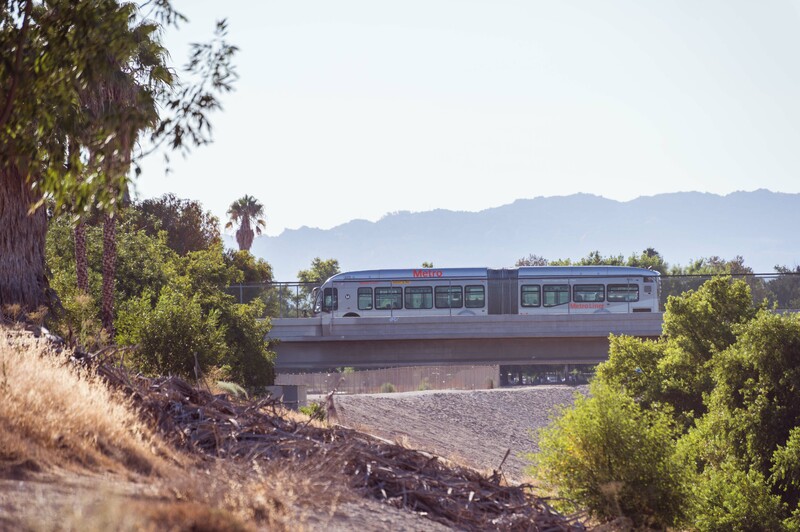 ART OF TRANSIT: The Orange Line crossing the L.A. River in the Sepulveda Basin earlier this week. More Orange Line stock photos free for anyone that needs them on our Flickr site. Just click above. I’ll be out shooting some pics along the Eastside Gold Line later today–wave is you’re riding by! Photo by Steve Hymon/Metro. As the photos show, a pedestrian detour sign instructs walkers to cross busy Venice Boulevard at a spot also signed as a no ped crossing zone. The California High-Speed Rail Authority held community meetings earlier this week in Burbank and Palmdale and has four more meetings scheduled this month around the area to discuss the environmental studies underway for the segment of the bullet train to run between Palmdale and Los Angeles Union Station. For purposes of the study, the agency is doing a review of the Burbank-to-Palmdale section and then the Burbank-to-Union Station section. Both have their challenges. Here’s a link to the meeting flyer and here’s a link to a PowerPoint on the two segments in our region under study. As I understand it, the High-Speed Rail Authority is planning to open bullet train service between L.A. and San Francisco in three phases: Merced to the San Fernando Valley, then Merced to San Jose and then both San Jose to S.F. and Burbank to Union Station. One hurdle, of course, is closing the gap between Palmdale and Bakersfield over/under the Tehachapi Mountains. Over the next couple of days I continue my test of the trains. My conclusion? If the goal of public transit is to transform the greater metro area into a walkable place where residents will want to abandon their cars, then Denver proper gets a B+, while the greater metro area is more like a C — it will take far more than a handful of light rail lines to rejigger the post-World War II, auto-centric suburbs of the West, as my morning walk to the station demonstrates. But if the idea is to give all those poor car-commuting souls non-vehicular options for getting around the greater metro area, then Denver’s system earns a B. As light rail lines out to the airport and other suburbs go on line in 2016, they may even move into A territory. After all, 82,000 daily trips on light rail are 82,000 trips people aren’t taking in their cars. And that’s a good thing. Dumb headline, dumb story. It’s great that Lyft is making it easier for passengers to split fares, but can Lfyt or any other car-sharing service really absorb (for example) the 1.1 million daily boardings on Metro buses? And are all bus riders — many using discounted monthly passes — really ready to pay the cost of using Lyft? Answer: no. There’s a much more realistic take on what Lyft and Uber are doing over at Streetsblog. From the comments on Streetsblog LA, I learned that the whole purpose of the center median reconfiguration of Venice Boulevard is to widen the street. Is this true? And if so, why on Earth do we need to widen one of LA’s most freeway-like streets? The only reason I’d be in favor of widening was if it meant replacing the current bike lanes with protected bike lanes in between the sidewalk and parked cars, Copenhagen-style. Also, using the center median as a busway would be an improvement. Many knowledgeable Rail Advocates believe the L.A.-Bakersfield segment, via I-5/Tejon Pass, should be built first. It would connect the Pacific Surfliner, San Joaquin and Capitol Corridors, greatly improving the existing trip times, while a bypass is built along the I-5 corridor between Bakersfield and the Bay Area via Altamont Pass. After completion, express trains would bypass Central Valley stops, while locals would veer off the HSR line at Bakersfield and Tracy to serve Central valley stops. This plan would save Billions in construction costs by using a more direct route, avoiding many tunnels and viaducts through Central Valley cities. A more direct route, with fewer structures and environmental impacts, would also save operating costs by reducing the design and operating speed necessary to meet the schedule on a longer route. This is exactly how HSR is done in Europe. Why does CHSRA insist on building the most costly and unsustainable alternative ? When handing out the federal money, the federal government insisted that the Fresno-Bakersfield section be built first. Don’t blame CHSRA for the choices of the Feds. CHSRA’s planned next segment (using state funds) is, in fact, Bakersfield to LA. The Denver article is a dead link. Regarding the VOX and Streetsmart stories on Lyft and Uber. A one word response: Jitneys. Google it. Jitneys have been around for a hundred years. Jitneys competed for (or stole) passengers from LARY and PE as early as 1915 according to historical accounts. Very good article on jitneys in the Pittsburg Post-Gazette dated September 7, 2013 entitled “Pittsburgh jitney service illegal, but thriving” appears on the list when “jitney” is googled.